Hal McGee's producer's note, 10:30 AM, Friday, October 4, 2013. Playing the tape for digital transcription was a performance OF the tape. Not a performance of the tape by me necessarily, as I had initially thought. The tape itself performed or didn't perform. 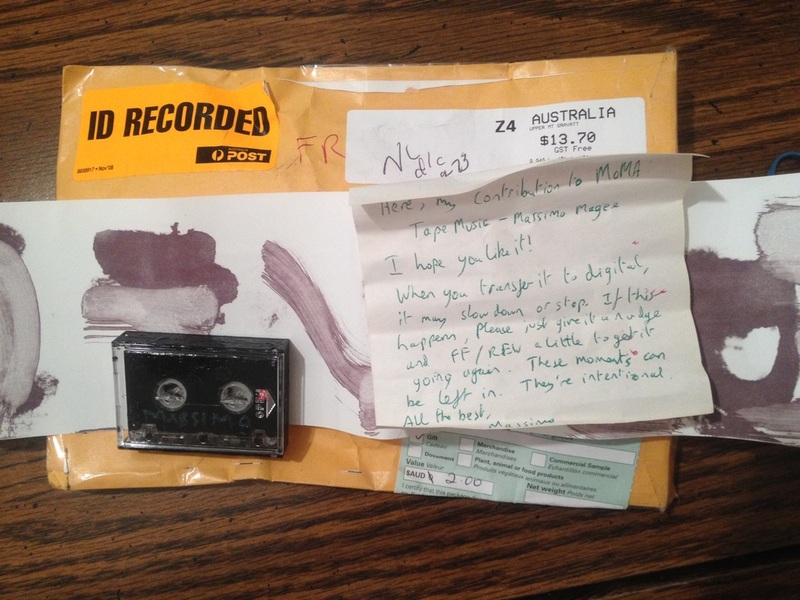 In the letter that Massimo Magee enclosed with his microcassette he told me that if the tape slows down or stops when I play it while transferring to digital, I should just give it a nudge, and to leave these moments in the digital master - they are intentional. 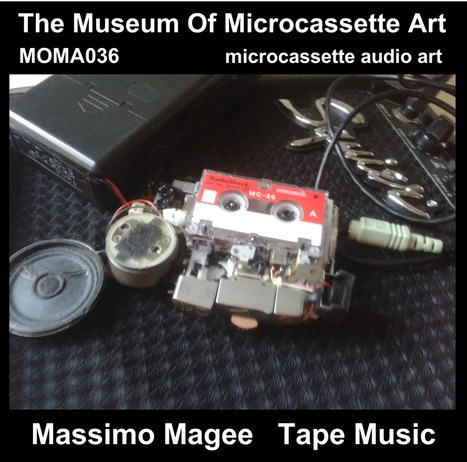 As with all previous MOMA albums I attempted to play Magee's tape in my Panasonic RR-930 desktop microcassette transcriber. This worked pretty well for a few minutes, and I was amused at the tape stopping and me getting to nudge it by pushing the PLAY button on the recorder, or, if that didn't work, pressing FAST FORWARD just a bit, and then PLAY again. I got the sense that I was performing the tape, or, rather, that the tape was performing or not! After about four minutes the RR-930 simply would not move the tape forward any more, no matter how much I tried to FF or PLAY the tape. It simply stopped. WTF, I thought! I ejected the tape from the deck to find that the tape had come unspooled from inside the microcassette and was crinkled as well! Additionally, I saw what looked like blue paint affixed to the the tape itself. I inserted the shaft of a ballpoint pen in one of the MC's spindle holes and spooled the tape back up into the microcassette shell. I retrieved one of my Sony M-470 handheld microcassette recorders, and inserted Massimo's tape and rewound it to the beginning of Side A. I played the tape in the M-470 as I digitally transferred it and it only stopped about three or four times. Again, I did my best to get it to move forward by pressing PLAY, but when that didn't work I used FF. After about 14 minutes the tape just kept on stopping, no matter how many times I pressed PLAY and FF. 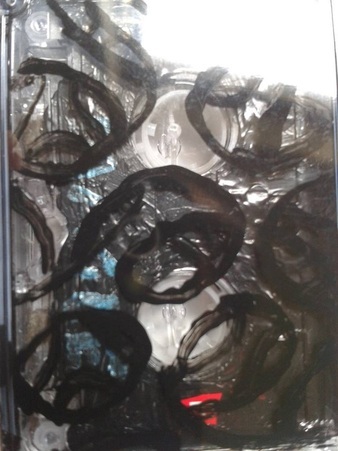 Massimo had painted the shell of the microcassette black and I couldn't see whether it was at the end of the side or not. Since most MOMA tapes usually run at about 15:40 per side of tape, I couldn't be sure if the tape kept on stopping because it had reached the end of the side or because of a blockage or obstacle as it had done previously on the side. Playback of Side B of the tape went much more smoothly, with only three or four stoppages, but also with very few glitch/bump sounds. And Side B lasted almost exactly 15:40, so that answered my question about the ending of Side A. 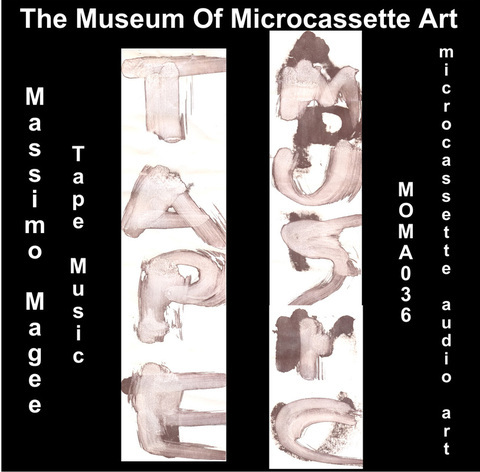 "just for the sake of interest, my tape has the words 'TAPE MUSIC' and 'WHY' painted with magnetic nail polish at various points along its length, interspersed with random splats and blotches."